What we all want more of? Free time. Today, we’ll be talking about Fancy Hands, a service that offers U.S. based virtual assistants to anyone in the world. I’m also going to show you exactly what to expect, and how to make the most of this investment in your freedom. The best part? It’s not expensive to get started, they’re only $29.99 a month. And you can also get 50% off your first month — so only $14.98 to start. More free time. For what? Mainly, more time to focus on the more important things. Who defines these “important things”? Well, you do. How often do you find yourself handling annoying, random BS tasks that you wish someone else could do. Too often. Right? If only we could blow away the competition by getting more actual “work” done and not having to deal with these boring, nonsense tasks. Or what if we had someone to help with the little things so we could focus on being creative and producing good work? There are far too many judgements and preconceptions about what having an assistant really means. But here’s the deal, we’re living a self-directed lifestyle, right? And if we want to be free and achieve great things we need to focus on what’s important. Outsourcing the minutiae of everyday life is one of them. This snapshot of my Fancy Hands dashboard shows you my usage for the last few months. The statistics that blow my mind the most? 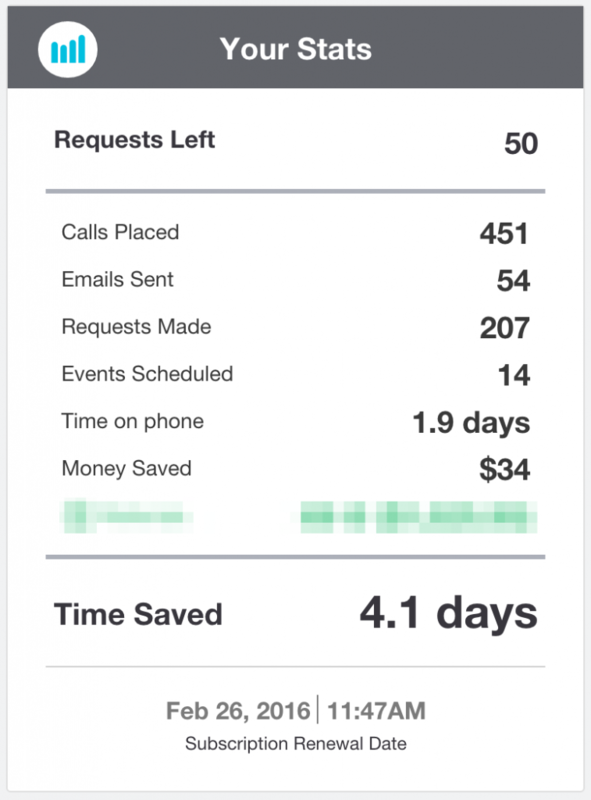 451 CALLS that I didn’t have to make, and 4.1 DAYS of time saved. Remarkable. A lot of time and money saved. Shipping issue: Call Frank & Oak (an online retailer) and find out why I haven’t received my shirt yet. If it’s still available please have them send it to me, I still want it. If it’s no longer available and they can’t send it to me just get a refund please. Lost Kindle: I just took this flight (see below for details and seat number) and forgot my Kindle in the seat pouch in front of my seat. Can you please contact the airline and recover it? Contact them locally and specifically ask them to grab it from the plane. I will pay for shipping if needed. Accommodations: Can you please find me accommodations for the night of June 30th in Rio de Janeiro? Highly rated is the biggest priority. Hostels are fine, but decent reviews with cleanliness as priority. Please reply back with 3 options, and then secure a reservation for the one I choose. Purchase: Can you please find me an Apple (genuine only) 60W MagSafe 2 Power Adapter? I’m okay with used (this will be a backup). Once you find the best priced one just purchase it and ship to my home address. Research: I need to find best service that will handle my postal mail. I want this service to receive all my mail, scan it, and forward me any items I specifically request (no packages, just letters & regular mail). I need this service to give me a California mailing address (preferably San Francisco) that looks like an actual address. I need great customer service and a strong track record (FYI: I went with Virtual Post Mail). If it’s legal, they’ll probably do it. Here’s a huge list of common tasks they can do. What can they not do? Here’s a breakdown of that. This was by far the hardest part for me, and is generally the most difficult piece for most people. Delegation is a skill that takes time to learn (a very valuable one at that). Always approach your assistant with an “if this then that” framework to your task. Just remember “IFTTT = If This Then That”. Don’t confuse this with the service. The more you can think of obstacles and “what if’s” ahead of time, the less back and forth you’ll have. Patience and detail are key to your success here. Note from Arman: Think of it as a game. If you’re able to get your tasks completed with no questions or obstacles, you win. The better you get at this, the better you’ll eventually be at managing a dedicated assistant, and eventually, an entire team. Overall, Fancy Hands offers an incredible value. With the smallest plan you receive 5 tasks for $29.99/month. 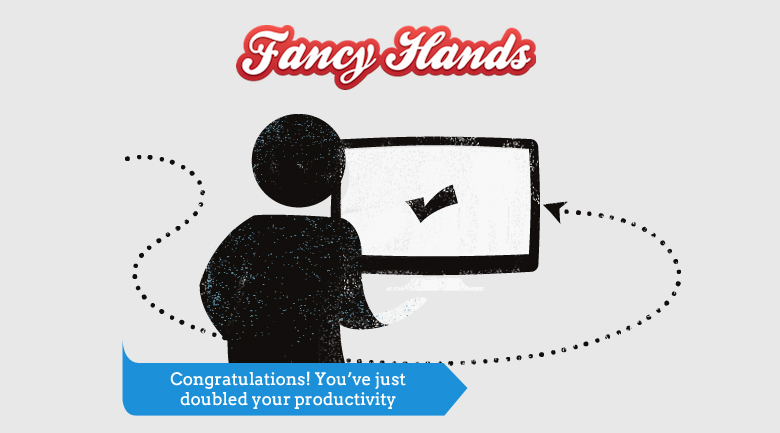 According to Fancy Hands, the average task is something that can be completed in under 20 minutes. My statistics show that I’ve saved 4.1 days or over 98 hours of time. This means each task is taking approximately 27 minutes. So let’s find out how what this would cost you per hour, based on the entry level plan. At $29.99/month for 5 tasks, that’s $6 per task. Each task at 27 minutes means you’re paying around $13 per hour of work. This doesn’t even consider the money your assistant can save you through the tasks. Here’s the key: If you make more than $13 an hour, you’d be making a very wise decision to use a service like Fancy Hands. The more you can free yourself from things that don’t require your personal attention, the more successful and fulfilled you can be. Very flexible. I love the voice memo feature, because as tasks come to mind I can quickly record and outsource immediately. I find that the average assistant wants to go above and beyond your expectations, especially if you’re friendly, clear, and use the IFTTT method above. Fancy Hands assistants are all U.S. based, sharp, and detailed. I’ve had assistants put together massive amounts of research, build beautiful spreadsheets, and fight for me with customer service departments. I’ve been thoroughly impressed on multiple occasions. I’ve also had assistants that complete tasks quickly, and don’t always ask the necessary questions to deliver exactly what I asked for. In part, that’s my fault because I wasn’t clear enough. As I mentioned, it’s important to be as clear as possible, otherwise you’ll get what you ask for. My experience has been pretty consistent. Most assistants do the job as asked, and occasionally one will go far beyond expectations. There have been two or three occasions where I was disappointed with my assistant. The fix was simple: ask for the task to be reassigned. After each task is complete you can leave a thumbs up or down, so it’s clear that quality is being monitored. The biggest benefit of a non-dedicated assistant service like Fancy Hands is that you can submit as many tasks as you like at the same time. A single, dedicated assistant can only handle so much. This means you’ll have multiple assistants working on your tasks, and as you become an experienced delegator your needs may grow. This model is the most scalable and many people opt to stay with Fancy Hands rather than Zirtual for this exact reason. Most tasks are looked at within an hour or two, some right away. Many are even completed that quickly. Time to completion all depends on the type of task. I’d estimate most are completed within 48 hours. See my final review and ratings below. Overall, I recommend Fancy Hands to anyone with no reservations. Summary : Fancy Hands is an indispensable, cost-effective, and reliable service. No matter who you are, there is a way to use Fancy Hands to create more freedom in your life. A great way to open the door to personal outsourcing and professional assistants. Highly recommended! Use my link (it’s basically a referral coupon) to try Fancy Hands at 50% off your first month. That works out to only $14.98. It’s an investment in yourself that will leave you instantly feeling less stressed, less busy, and more in control. Please comment below with any questions and feedback. If you do sign up, please let us know how it goes. Help us all learn from your experiences and share your successes/struggles.